Tires depend on good tread condition depth to maintain traction and to shed water on wet roads. 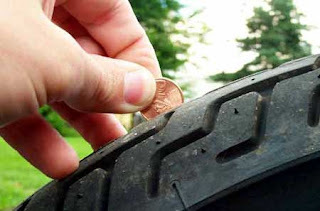 The tread should be checked at least once a month for excessive and uneven wear. The most accurate tread depth measurements are made with a simple tread depth gauge available at any parts store. Or you can use the traditional quarter and penny tests.